The small central European country of Slovenia is often overlooked by skiers in favour of the more well-known western European resorts of France, Italy, Switzerland and Austria, making it one of the best kept secrets in European skiing - especially for those on the lookout for bargains. Despite their comparatively low altitude (most are under 2,000 m) its resorts enjoy good snowfall as well as fantastic scenery and a surprising variety of slopes; ideal for a short ski break. Basing yourself near Lake Bled you can ski the resorts of Vogel, Kravec, Kranjska Gora and Soriska Planina in the Julian Alps. Enjoy quiet slopes, warm hospitality and filling local dishes at the mountain huts that cost half what you would pay in France and Austria. Local specialities include Kranska Klobassa a Slovenian sausage which enjoys protected geographical status, wild boar goulash and some good hearty soups. Beautiful Lake Bled is a wonderful setting for your ski holiday in Slovenia; its fairytale castle perched on a cliff overlooking the lake and its unusual island church give it an ethereal quality, and the charming town that is popular with tourists in the summer is a wonderful place to go for a stroll one afternoon. There is even a ski slope on the edge of the lake which provide some of the best views of any slope in Europe. Don't forget to sample the cream cakes here, a local delicacy. Located above Lake Bohinji in Triglav National Park, this resort offers 22 km of blue and red marked runs and a large snow park. On a clear day you can enjoy wonderful views of the lake. Beginners will enjoy the empty runs while more experienced skiers will enjoy the 7.5 km top to bottom along a varied red from the highest point at 1800 m down to the cable car station at 570 m, the longest ski run in Slovenia! The resort also offers good freeride terrain, a snowpark, mini freestyle park, X-run and children's park. Clive at the Reka Hisa lodge, our accommodation in the area, says this resort is perhaps his favourite, "a real winter wonderland". This resort, located 25 km from the Slovenian capital Ljubljana, offers some 30 km of piste and it is suitable for all levels of skiers; roughly half the runs are red with the others evenly divided up between blue and black. There is also a snowpark with jumps, boxes and rails, a giant slalom slope and a timed speed test. 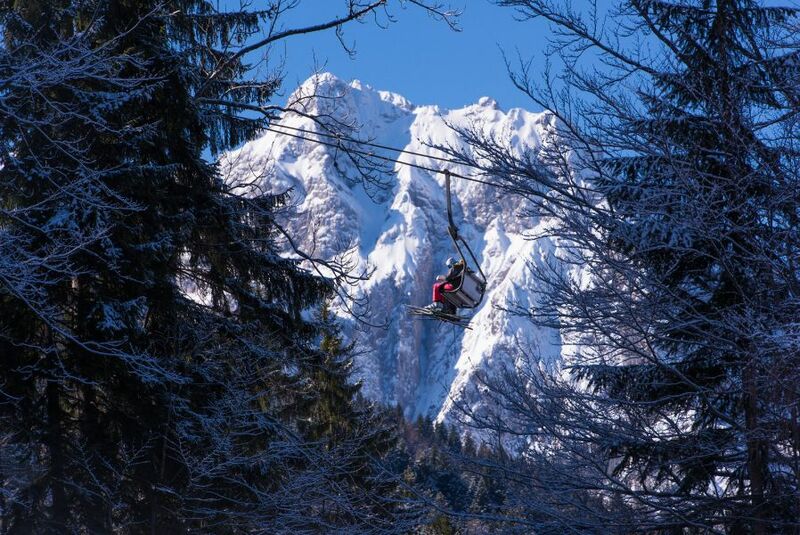 Just 10 km from Ljubljana airport, Krvavec is ideal for an extra day of skiing if you have a late flight. Perhaps the most famous of the Slovenian resorts, with 20 km of pistes and great for beginners and intermediates, KG is an annual fixture on the ski world cup circuit. It also offers a snowpark with half pipe and 40 km of cross country ski trails. The village centre offers a charming market square with church if you find time to explore after your last run down. Limited in terms of size (9 km) but offers some challenging fast runs for more advanced skiers and boarders. Our ski holidays in Slovenia give you the opportunity to ski all the above resorts while staying near Lake Bled, just 40 mins from Ljubljana airport. They include half board, ski pass, ski hire and return airport transfers as well as private transfers to the slopes each day provided by the lodge. You can chose from our flexible 3-7 night package and our 6-7 night learn to ski package which includes ski lessons for those who want to learn or improve their technique. You will stay at the charming Reka Hisa riverside lodge which sleeps up to 13 people; cosy chalet-style accommodation run by Clive and Myrna whose warm welcome will make you feel completely at home. You can enjoy a delicious 3-course meal accompanied by local wines and afterwards either relax at the lodge in the company of your fellow guests or venture out into nearby Bled. If this sounds like your kind of ski holiday, both packages are available to book online for this winter. Any questions? Just drop us a line.